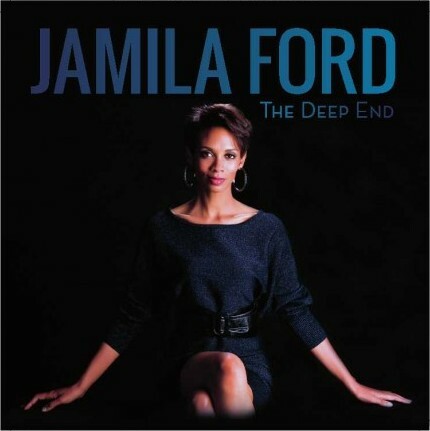 I spent part of my time trying to figure out who Jamila Ford covered on the song “Silencio.” The tune is one of five featured on the California vocalist’s new EP The Deep End. I figured that it had to be a remake as the other four cuts, including the funky bass driven rendition of Miles Davis’ “All Blues” that features Ford’s soulful interpretation of Oscar Brown Jr.’s lyrics, were remakes. “Silencio,” with its New Orleans shuffle meets Brazilian bossa nova had me thinking this was something penned by Jobim. Then I read Ford’s biography and realized that “Silencio,” is an original, and I came away from The Deep End even more impressed. “Silencio” fits in with the better-known tracks such as “Gentle Rain,” and “Sugar” in every way. The Latin tinged arrangement is one to which couples can dance, but it’s Ford’s lyricism when describing the unspoken and spiritual connection between lovers that will lead listeners to assume this tune came forth in a different time – a time when quality wordsmithing was an expectation. Finally, Ford possesses a vocal instrument that allows her to move from the achingly melancholy ballad of longing, “Wild Is The Wind,” to the swinging blues of “Sugar” with an effortlessness that makes it appear that anyone can do it. However, Ford sports a CV that reminds listeners that such skill is the end result of years of hard work studying and backing up talents such as Melody Gardot. Ford definitely learned from Gardot because “Silencio” is every bit as catchy as Gardot’s breakthrough cut “Baby, I’m a Fool.” Jamila Ford is the real deal, and has the skills to make listeners go over The Deep End for her. Heartily Recommended.